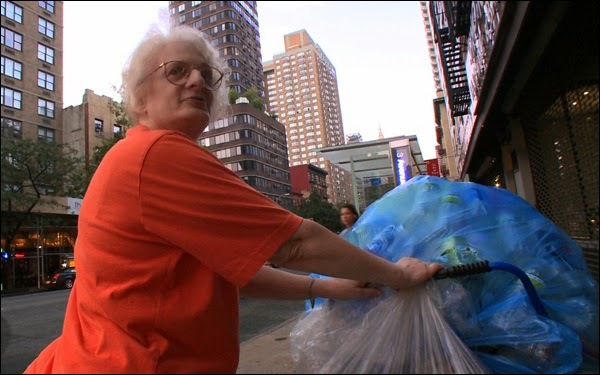 While employed New Yorkers pass by in a hurry on their way to and from work, the men and women of Redemption make their living on the sidewalks of the city, forced to collect discarded cans and bottles and redeem them for small weekly sums that barely cover the simplest of living expenses. 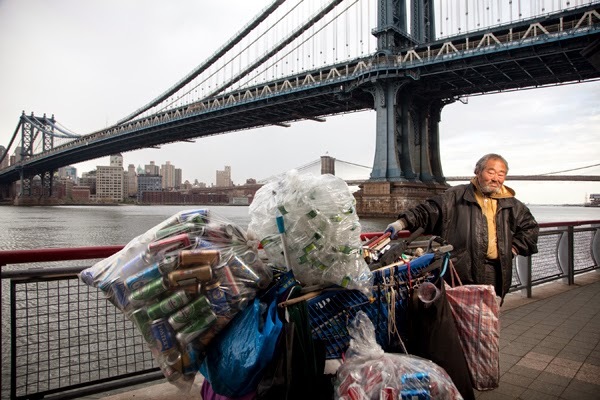 60-year-old Vietnam veteran Walter is the first to describe the rapidly growing trend, remarking how the number of canners in the city has skyrocketed as odd jobs that once supported the poor have disappeared. Walter also explains the tireless demands of canning, which requires working long hours “because if you don’t do it full time, you ain’t gonna get what you need.” For some canners, full time means 20 hours per day. As we see, the subjects think and calculate in terms of cans. Passing a fancy chocolate shop, Walter muses that the confection in the window display costs the equivalent of 450 cans, an untold number of hours on his feet. A townhouse on the Upper West Side? That’s 100 million cans. But few of the canners are bitter. 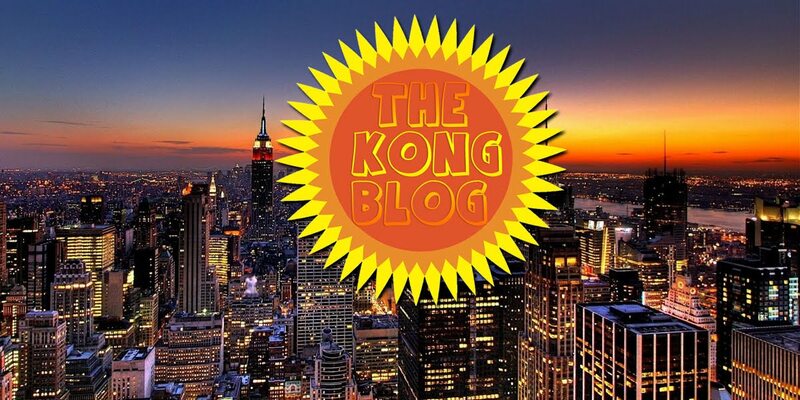 Joe passes a luxury apartment building and admires it, commenting, “I’m not against rich, I’m against injustice…greed and injustice.” Hassan assures the filmmakers that he doesn’t need money to be happy. Some see their work as helping to keep the city clean; others just believe they’re participating in a survival of the fittest. Almost all admit to an overriding sense of fatigue, either overtly or through their plodding walks to the redemption centers at the end of their days. Though the competition of scavenging on the same streets can become contentious, the community of canners is surprisingly one of kindness and shared understanding. When Susan, a former computer sales executive who used to work at IBM, becomes frustrated by another canner’s impingements on her territory, Joe arrives to calm her, taking her hands and dancing with her on the street. Jamie, a man who bikes with his bounty to meet a redemption truck in Crown Heights, makes conversation with a friendly fellow canner, an ex-con who admits that incarceration might be better than his current situation – at least in prison he received three meals a day and a bath. Jamie chuckles and moves on. 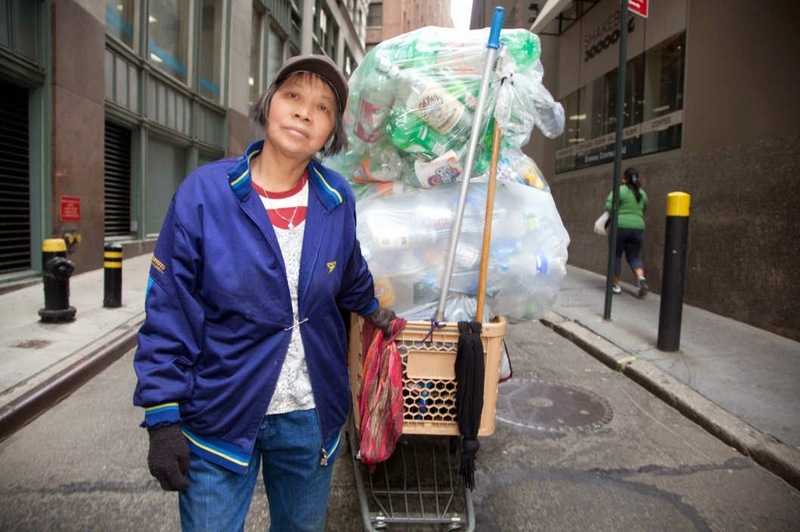 Lilly, a cheerful canner in Chinatown, who speaks limited English, lives with six others in a tiny onebedroom apartment, fortunate in comparison to homeless canners who sleep on park benches or at redemption centers. Lilly helps out her friend John, a homeless Japanese canner, who used to work at the World Trade Center, by giving him a shave and cutting his hair. The two have known each other for years, but cannot communicate because of their language barrier. “What are we supposed to do? There’s no work,” Nuve asks near the film’s conclusion. 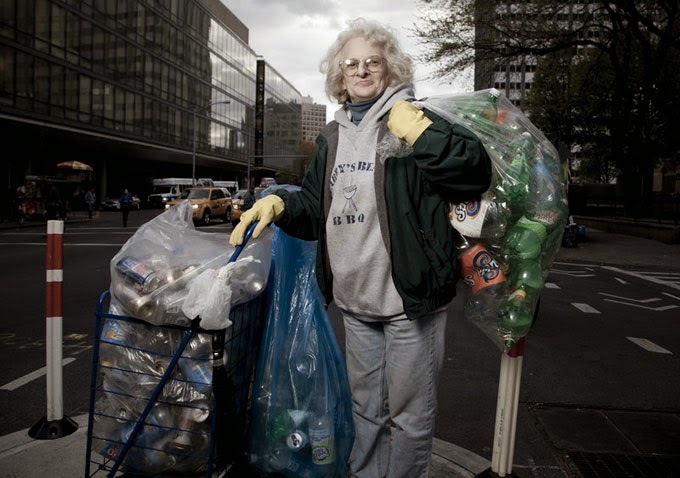 A dedicated and loving mom intent on giving her children a brighter future, she collects cans all day with her youngest son after dropping her other kids off at school. Such a dogged will to persist runs throughout many of the people profiled, who have canned for years and have no reason to remain hopeful. And yet they do so – rising each day to sift through the waste of the cityand survive another day.